A brothel madam has been jailed for trafficking woman into the UK and scaring them into prostitution by making them eat live snakes in an African black magic ceremony. Lizzy Idahosa, 24, and her husband Jackson Omoruyi, 41, made more than £70,000 out of the Nigerian women, who were terrified with voodoo and made to see a witch doctor for a sinister 'juju' ceremony. Heavily pregnant Idahosa was sentenced to eight years today and broke down as she was told she would be separated from her child when it is born. 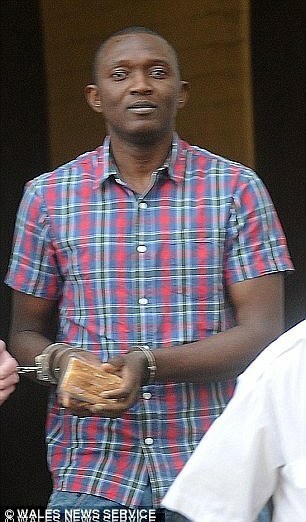 Omoruyi was sentenced to two years behind bars. Idahosa was convicted of trafficking the women, inciting them to become prostitutes and transferring criminal property, while Omoruyi was found guilty of money laundering. 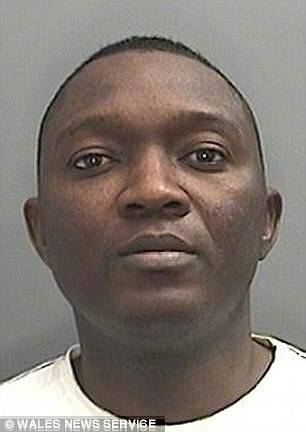 During the couple's trial at Cardiff Crown Court, the jury was told that the two victims, aged 23 and 29, had their pubic hair shaved and forced to eat live snakes and snails as part of the ritual, and then flown to Britain in the belief that they were going to find a better life. Speaking about her horrific ordeal the 29-year-old said: 'It was not a big snake, but it was alive.I just closed my eyes and put it in my mouth. When the women arrived in the UK they were put to work as prostitutes, working in brothels at massage parlours across England and Wales.